The respectable Krantiveer Nagnath Anna Nayakawadi who is freedom fighter of 1942 freedom movement and who fought against british rule in antigovernment movement in co-operation with Krantisinh Nana Patil has started voluntary schools in freedom period with view to educate the people, and create love in them about our country and to make the education as a device of social revolution. After independance with inspiration of same aim they have established Kisan shikshan Sanstha in June 1949 at Walwa with a view to provide educational facilities to boys and girls students from walwa and surrounding area. The membership fee of sanstha was fixed only 25 paisa with intense to participate the common man also as a sanstha's member. The base of social revolution movement was fixed by giving chance of sansstha's membership to common persons of society. Hutatma Kisan Ahir Secondary & Higher Secondary (Multipurpose) School was established as living educational memorial in the name of late and great colegue martyr Kisan Ahir who sacrificed his life in freedom movement of 1942. 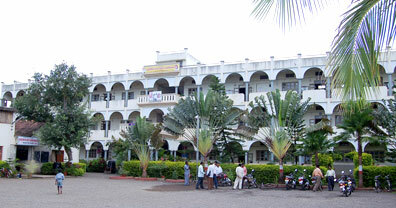 This school has background of freedom movement. In this school provisions of Arts, Science Agriculture and Technical education has been made available and admissions are given to students without looking into therir religion, castes and creeds. Thus Krantiveer Nagnath Anna has contined the flag of legacy of Karmvve Anna, Chhatrapati Shahu Maharaj, Mahatma Phule and Dr.Babasaheb Ambedkar. Hence after uptill now he has been doing the role of social revolution through social service day and night. Since the establishment of sanstha Nagnath Anna has established five secondary Schools, One senior college, three hostels and one sugar factory through the medium of Kisan Shikshan Sanstha. The other socially useful institutions like Hutatma Bank, Multinational Hutatma Sahakari Dusha Sangh, Hutatma Bazar and montesary and primary school for small childerns are also playing their roles. There is best tradition of best games in various branches of Institution. There is separate facilities of separate training camps for players and for this purpose specially trained coachs are appointed for separate games. The school and college students many time succeded at taluka, District, State and National level games and awarded by various medals of different games. The Kho-Kho is special game of this institution. In last year i.e.2004 about 35 players of Kho-Kho game have won the first prize at state level in gramin shaleya Krida competitions. About 9 Kho-Kho players have been selected for national game. Todays both Kho-Kho teams representing Kolhapur division at state levels are of our school In last year our one player has won second prize in poll vault at state level. The teachers working in various branches of institutions. are well experienced educated and trained. In school alongwith all students the special training and coaching extra classes are arranged for preparing them for examination. The educational standared of school and college is superior or best due to extra coaching classess, extra-exams and special guidence. The huge, well planned, cheerful and attractive garden is prepared infront of school at Walwa under the guidence of trained advisors. It adds in beauty of education surrounding. The various ornamental plants like mango, coconut, Ashok trees, Raintrees, Clerodendron, Rose, Jasmine, Thuja, Rangoon Creeper, Tuberose, Jasminum, Night Queen, green champaka and parijatak as well as palm and other flowering plants are arranged in garden in attractive way. Similary in surrounding area of Hutatmanagar Sonawade various trees like mango, coconut, chiku, cashewnt, areacanut, buyberry etc. are planted in area of 40 acres around school premises. Thus there is all sided developments of sanstha and it's branches and there is no doubt that in near future it will increase step by step because all of these institutions have valuable guidence of Hon.Vaibhav Kaka Nayakawadi, Inspiration of Krantiveer Nagnath Anna and blessings of Krantisinh Nana Patil and Krantimata Laxmibai Nayakawadi and sacrifice of many Martyrs and healty Co-Operation of all of you. Shri Vaibhav Nagnath Nayakawadi. President At/Post-Walwa, Tal.Walwa, Dist.Sangli. Shri Dattatraya Dnyanu Sapkar. Director At/Post-Walwa, Tal.Walwa, Dist.Sangli. Shri Shamrao Dnyanu Sawwashe Director At/Post-Walwa, Tal.Walwa, Dist.Sangli. Shri Tatoba Bhau Waje. Director At/Post-Walwa, Tal.Walwa, Dist.Sangli. Shri Mahadeo Shivappa Kamble. Director At/Post-Walwa, Tal.Walwa, Dist.Sangli. Shri Ajij Rahiman Chaus. Director At/Post-Walwa, Tal.Walwa, Dist.Sangli. Shri Vasantrao Tatoba Pawar. Director At/Post-Walwa, Tal.Walwa, Dist.Sangli. Smt.Navasabai Pandharinath Khot. Director At/Post-Padavalwadi, Tal.Walwa, Dist.Sangli. Mrs.Kusumtai Nagnath Nayakawadi. Director At/Post-Walwa, Tal.Walwa, Dist.Sangli.